Legacy PCB/Appliance. ACES' Alumni continue to contribute to our program through their former achievements. PB machines, Schaffer Traffic Lights, Morland Bargraphs, Reed MatrixMadeEZs, Logush nRFBreakouts, and the Raymond RTCs were all simple but brilliantly conceived devices that are instrumental in support our current learning. 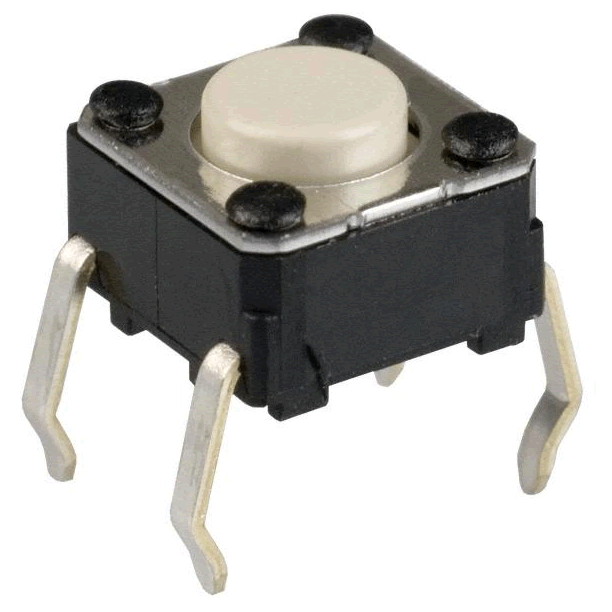 Take a look through our online archive of ACES PCBs for inspiration. To further strengthen your printed circuit board design skills and to give you an opportunity to leave your mark on RSGC's ACES program, you are tasked with the opportunity and challenge of imagining and designing a board that YOU feel would have made YOUR study of electronics a richer (and more time-efficient) experience. The best projects are simple, replace a single task you do over and over, and can be put together with a few handy parts. For my part I have created and continue to maintain a library of common THT parts we use in the DES all the time. Download the library ACES_THT.lbr and use it in your projects. Wires. Wires are a pain. They're (relatively) expensive, unreliable, time-consuming to manipulate and esthetically displeasing. With so little going for them, ACES tend to try to minimize our reliance on them in our PCB designs. ACES prefer PCBs that function as appliances in that they can be inserted directly into breadboards or Arduinos. Hardware. A terrific supplier for a broad range of fastening hardware is McMaster-Carr. Look over their inventory. You'll be shocked at the breadth of their offerings. Overnight delivery from the US! Acrylic cutting. Contact Sawdust&Noise for your acrylic laser-cutting and CNC milling needs. Aak for Guy. Encasement. Your ViaCAD/CAD design skills also allow you to imagine an encasement for your PCB/Appliance. Designing and printing one would give you the further distinction of being the FIRST ACE to have ever done so! 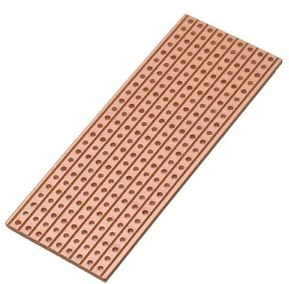 You've thought deeply about a simple PCB/Appliance that would have made a previous project you undertook either easier, or richer. You have created a prototype as evidence that your circuit will actually work. Launch EAGLE and add the ACES_THT.lbr file to the library folder of your EAGLE project folder. Create a NEW project, the filename of which is surname_description.sch where you change both parts accordingly. Using the components from your prototype, create your schematic, connecting the leads as your prototype suggests. Try to stay within the parts in the ACES_THT library as they have been developed with young ACES in mind. 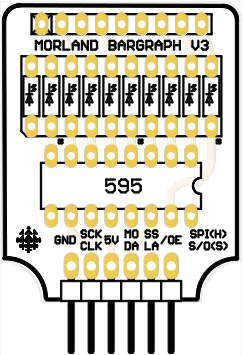 Once you're satisfied that the schematic is correct, request that EAGLE create a board file. Save both files, regularly. Arrange the components on your board in a manner that reflect your understanding of how they are accessed. Be sure to add the appropriate-sized ACES_LOGO in board view, and position it conspicously. Do your BEST to stay within 5cm × 5cm as larger boards ost $$$. Add the DirtyPCBs-compatible CAM Processing file, ACESTHTLegacy.cam to the cam folder in your EAGLE projects folder. Launch the CAM processor, open the ACESTHTLegacy.cam file and review the the layers you require for each Gerber file. Check the Export as Zip check box and the hit Prociess Job to save a ZIP file of your project's Gerber Files. Upload your ZIP file to the DirtyPCBs website selecting the appropriate options. Go back to earlier steps as required. once you are confident that we will not be wasting $$$ on shallow tihnking, attach your .sch, .brd, and .zip files to an email to handin under the Subject Line: Legacy PCB/Appliance Files. In the body of your email to handin be sure to include your preference for the PCB colour other than black. I will place the group order after school on Wednesday. My best guess is that they wil arrive at RSGC in time for distribution in class on Tuesday April 30. You will have the rest of the school week to solder and test, in time for your DER submission on Saturday May 4. Design and print a housing/case. 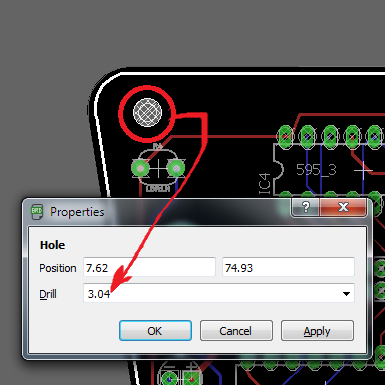 Exporting the .brd file from EAGLE as a .dxf and importing it into your CAD application of choice makes short work of hole locations, battery access points, switch locations, etc. Part 2. Due Saturday April 13. Procedure. A few paragraphs detailing the PCB creation process. Media. STRONG Images of your prototype, EAGLE Schematic and Board views, and Dirty PCBs rendering image. A video is NOT required at this stage. Reflection. Your thoughts on the project to this point and your expectations for the receipt of your protopack. Submit your DER summary to handin on Saturday April 13, under the Subject Line: Legacy PCB/Appliance Report, by midnight. When the PCBs arrive start soldering and testing. Unforeseen, misunderstandings and oversights will need have workarounds developed (there isn't enough time to go back to China for Version 2). Your video should document this phase and demonstrate your device in an application meant to suggest what future ACES could do with your device. Add a second phase to your Reflection as well, summarizing this CAD/CAM experience. Submit your DER summary to handin on Saturday May 4, under the Subject Line: Legacy PCB/Appliance Report (Final), by midnight. Bring one or more soldered and tested samples to class on Monday May 6 for a quick presentation and leave one with me. I will take one or more of the BEST creations, adapt them for use in next year's courses and make you famous in the process. Good luck. Project 6. ACES Rover. This will one of the most demanding projects our ACES program will present you with. What you do with the opportunity (like all others) is completely up to you. You can sit back and let your team members carry you through to the final report or you can hold your head high in March knowing that the success of your group was due in no small measure to the skill and dedication you poured into it over two months. 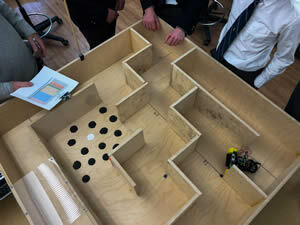 Monday January 28	Day 6	1:30-2:50: First chassis iterations should be coming off the printer this week. Battery Considerations below. Monday February 25	Day 8	8:15-9:30: Final team session prior to qualifiying runs on Friday March 1. For rechargeble AAs, 8 Eneloop Pros are a good solution. Don't forget to pick up a charger as well. Save the receipts. Tuesday March 5. Rover Competition. (Day 6, Per. 4). Category and Competition Evaluations. If we hope to bring this project to a successful conclusion, leaders must maintain and file their team's updated Gantt Chart, weekly. Project 4. MatrixMadeEZ. 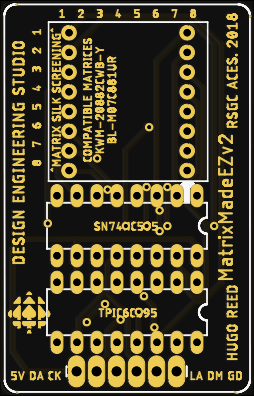 For his PCB project in Grade 11, Hugo R. (ACES '19) imagined, designed, and developed a handy PCB that future Grade 11s could exploit to hone their LED matrix software animation skills. We're going to incorporate Hugo's terrific little device into an ambitious standalone project. To assist with your time-management pursuits, I'm strongly suggesting you discipline yourself to stick to the timeline below to enable a successful conclusion two weeks from now, on Saturday November 17. By Tuesday November 6. 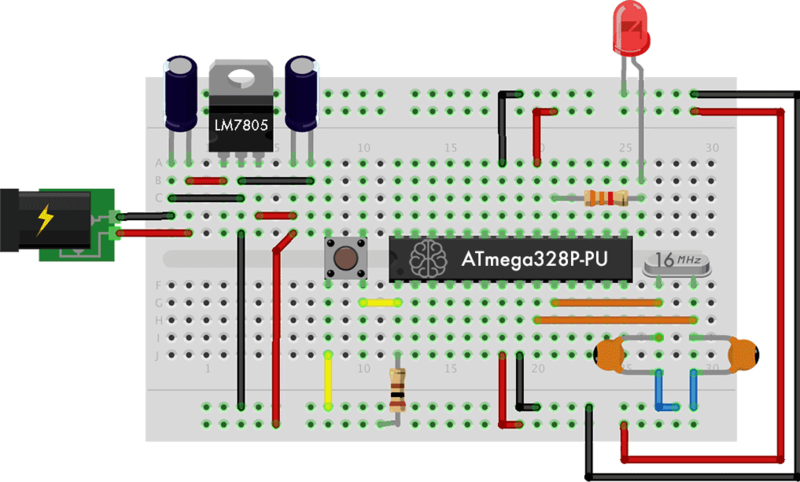 Before you head home on Tuesday, you've demonstrated that you've worked through the concepts introduced last class (Friday November 2) to the point that the standalone breadboard version of the ATmega328p I gave you can be flashed with the Blink sketch. This is accomplished with the help of your Sparkfun Pocket Programmer and the ACES ISP Breakout Board and cable I distributed. Bring your working system to my desk and I'll give you a PCB and 6-pin right angle header. The other parts can be found in your kits. Note: Be sure to orient your Matrix the correct way as it is virtually impossible to repair if it isn't. By Thursday November 8. You ARRIVE to our Period 3 class with your MatrixMadeEZ board soldered up and wired either to your Arduino or your standalone. Silk screenong on Hugo's board tell you how to solder it. I'll have mine ready to go and the lesson will introduce you to simple matrix PoV/animation techniques. The project requires that you develop some form of creative PoV animation involving more parts (sensors, ICs, etc) from your kit, functioning on your standalone Arduino and reflashable on the fly as evidenced in your video. The more unique it is, the better your mark. You'll appreciate the luxury of a four-day weekend to experiment if you maneuver yourself into that position by the time we break Thursday afternoon. 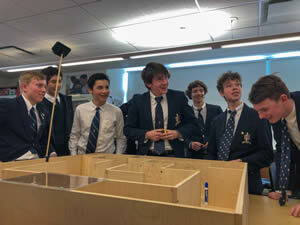 Wise 11s are in the DES after school Tuesday and Thursday keeping up with their peers. By Wednesday November 14. As has seemingly become the norm, we only meet ONCE in the second week of this projects duration, on the Wednesday. Note: Parent-Teacher interviews are scheduled for Thursday the 15th and Friday the 16th so the DES is not available. Ambitious and organized ACES will consider pushing their creativity into possible areas such as 3D printing, soldering their standalone Arduino onto a (stackable?) PermaProto board(s), a deluxe ACES Knight Light using an LDR to control the MatrixMadeEZ's dimming feature (DM Pin) or digging deeper into the incredible ICs their kits or in the tipout bins at the back of the DES. The 6-pin right-angle male header will allow your device to be mounted vertically in your breadboard, driven by your standalone Arduino. Make Hugo proud. Project 3. 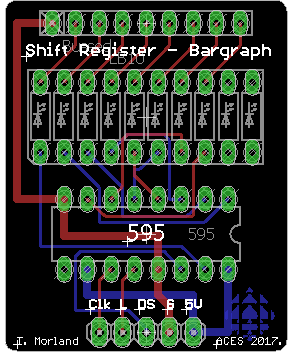 Shift Register - Bargraph. When Tim Morland (ACES '18, Queen's Eng '22) was in Grade 11, he designed the adjacent output PCB based on the 595 Shift Register and a bargraph. Your toolkit contains the SN74HC595 IC, a 16-pin IC Socket, and a 10-LED red bargraph. The remaining parts, a 5-pin right angle male header, 330Ω 8-pin bussed resistor network, and Tim's PCB, will be provided to you. You are asked to create a unique and interesting prototype that employs Tim's Shift Register-Bargraph output device. In addition, just as James Lank dipped into his toolbox and incorporated the LCD screen into his previous ASCII & Buttons project because he was intrigued to discover its potential, each of you is required to do the same. Identify a part you have never previously used and combine it with this Shift Register-Bargraph output device in a meaningful way. Finally, one shortcoming of this device is that there are 10 LEDs in the bargraph but only 8 outputs provided by the onboard '595 shift register. It's kind of like a packs of hot dogs are sold in dozens but the buns, in packs of eight. This is not good but it clearly presents an opportunity for the creative amongst you. Your mark will be based largely on how creative and how DIFFERENT yours is from everyone else's and how potentially USEFUL your application could be. Give it some deep thought and push yourself hard your efforts could possibly form the basis for a future ISP. I'm looking for trailblazers this weekend, not followers. Again, for the engineering and for the unique design and creativity. Project 2. ASCII & Buttons. Time to let the horses run. We've reviewed the Arduino's recognition of the ASCII characters and it's ability to read (properly conditioned) button input. For your second project I want your imagination to take center stage in the pursuit of a creative application involving button presses, ASCII characters, some form of manipulation/processing of the two, and its display. Insert a full divider page with ICS3U, in large font, centered on the page. Add another blank page, following. Adjust the new header to reflect the new ICS3U course code, but continue the page numbering in the footer. Begin this year's submissions with a report entitled, Project n. Traffic Light Assembly and Testing. For n you may continue the project numbering from last year or start again, your call. Be sure to update your ToC prior to submission. Since many of you will be pursuing your driver's license in the near future, the focus of this first summary is the design, careful soldering, programming and thorough testing of a Traffic Light. 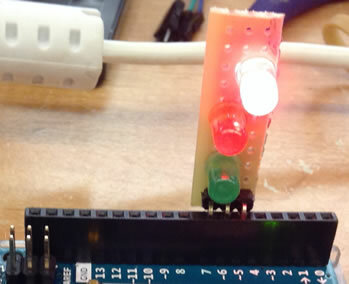 For the assembly aspect of this project you will solder one each of a green, yellow, and red LEDs onto the section of stripboard you have been provided with. NOTE: The stripboard only has three strips. The placement and orientation of the LEDS is tricky and you must give it some DEEP THOUGHT if you're going to be able to program it so it operates correctly. Take care as there are NO replacement parts. A three-pin right-angle header, soldered at one end, will enable your device to be inserted directly into your Arduino's female port pins (see photo) Be sure to document your soldering of the device through media acquisition that you can include in your report. For the testing aspect, you will include media as well as a simple sketch based on our discussions in class. The fully documented sketch should cycle through the LEDs continuously with the green and red remaining on for 3 s and the yellow, 1 s.
In your report, include the sections Purpose, Reference, Procedure, Code, Media, and Reflection Heading 2 (or 3) style. A full Parts Table should appear right-aligned within the Procedure section.